dotted with monasteries and castles, the Perusini estate is the ideal starting point to discover the val- leys that separate Friuli from Austria and Slovenia, or perhaps just for a dose of relaxation. Guests can go on scenic walks in the nearby “Bosco Romagno” park and visit the Abbey of Rosazzo (10th century) or the castle of Rocca Bernarda (15th century). 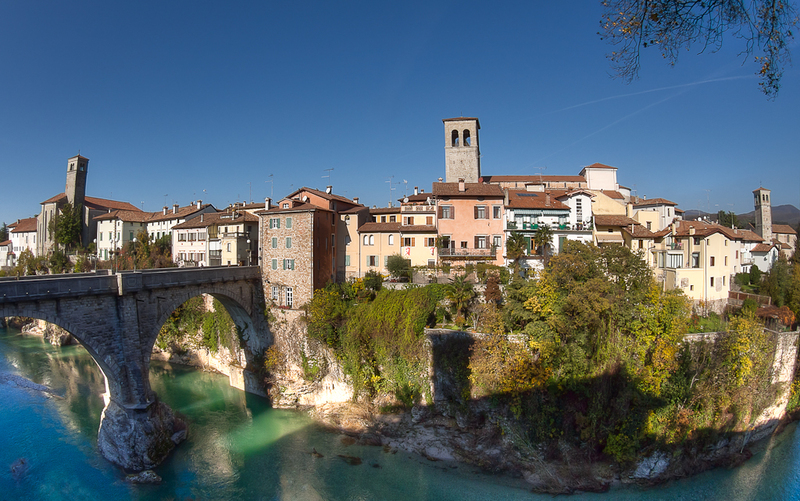 Cividale, the medieval capital of Friuli (6 miles), and Cormons (3 miles) can be reached via beautiful cycle paths through the hills. Cities, seaside and natural places are also within easy reach, where you can practice sport or soak up the nature. (25km): An ancient city rich in monuments and buildings from the Venetian era. Not to be missed are the frescoes of Tiepolo in the Palazzo Patriacale, true gems of Venetian painting. (30km): This Roman colony founded in c. 181 BC was the ancient capital of the Augustan Regio X Venetia et Histria as well as the metropolis of the Christian Church. It is the most significant archaeological site in Northeast Italy together with Ravenna. Not to be missed are the magnificent Early Christian mosaics in the medieval Basilica. (60km) This city and harbour from the Hapsburg era is located in a beautiful setting on the bay, with magnificent views looking out towards the Adriatic Sea. Sightseeing: the Castle of Miramare where Empress Elisabeth of Austria stayed, the Museum Revoltella, full of modern and contemporary works, the central square “Unità d’Italia”, not for getting a stroll along the seafront, past the “Canal Grande” and through the beautiful medieval ghetto. Trieste has plenty of old restaurants and taverns where you can enjoy traditional dishes. (10km): Old town of Roman foundation, the city is rich in Lombard heritage among which stands a magnificent temple. In this wonderful medieval city centre, you can visit the Cathedral and the Roman Archaeological Museum. (70km): It has a network of 21 kilometres of passa- ges, galleries and chambers. You will take the train through the underground world of most visited tourist cave in Europe to see magnificent caverns and glistening stalactite formations. (40km): The island of Grado offers miles of beaches, most of which are south-facing. Interesting also is the lagoon, with its rich variety of plant and animal life, and thatched roof houses formerly inhabited by fishermen. The historical centre of the city is particularly beautiful, with the two Early Christian Basilicas of St. Euphemia and Santa Maria delle Grazie. (60km): Situated on a green peninsula, Lignano is the ideal place for swimming in the sea and doing water sports. It is also well-known for its summer nightlife. (50km): In the mood for some fast-paced action? Then head to the Isonzo river in Soca (Slovenia), one of the most scenic rivers in Europe, where you will safely experience the beautiful sights of the river and its uncontaminated surroundings. 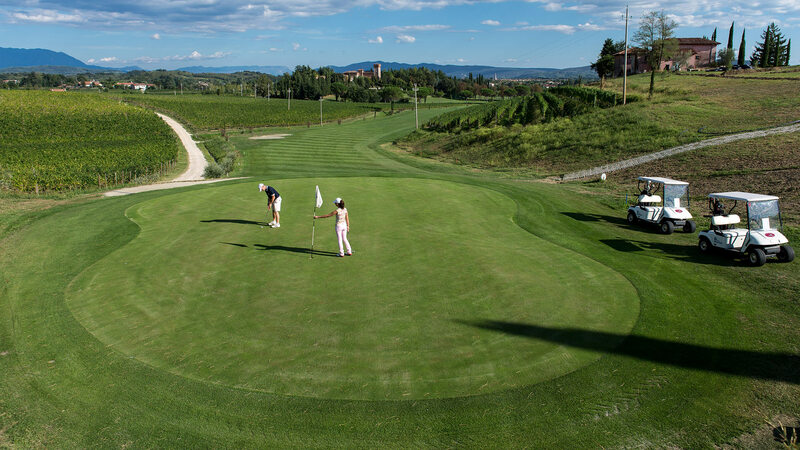 (10km): In the splendid set- ting of the Castle of Spessa is a magical 18-hole golf course, designed by the famous architect Giacomo Cabrini. carrelli e cart a noleggio, club house, bar, ristorante, spogliatoi.